Recently, I was presented with a fun opportunity to participate in a Style-Off, hosted by the lovely Nelia at StyleBlog.ca. The two of us, along with the beautiful Elizbeth of Chic Heroin, were assigned the task of styling a Gap t-shirt maxi dress. There are so many ways to wear it, but my personal mission was to make this dress as figure flattering as possible. A waist-cinching belt was a no brainer, and I was thisclose to leaving the rest of the piece as it was. A last minute twisted knot (secured with safety pins, of course!) made the dress more flattering on my 5’3 frame and created a silhouette that felt much more “me”. I would love it if you went over to the voting page to vote for your favourite look (which is hopefully mine, but I’ll understand if it’s not ;))! You did a great job styling this up! You totally changed the shape – nice one! I love the outfit. Great idea with the twist! What a creative way to wear a maxi dress, Jen! I’ve tried this dress in store and it was way too long on me. The other 2 ladies did a great job styling this dress as well. Enjoy the rest of your week! I’ve been wanting a maxi dress lately, and this has just inspired me to restart my search! What a great look. wow you totally made a simple dress, yours! i love the twist at the bottom it really did make it figure flattering 🙂 you most definitely have my vote, I love love love creativity! I might be a bit biased, but of course I voted for you! You put a great twist on the maxi skirt and made it look like it was meant to be like this. Cute! Love love the way you styled it, so creative! You would never even know it was a long dress! That was a great idea of tying the knot. I have a hard time pulling off a long dress too with my short frame but great job styling! Love the way you knotted the dress, you look beautiful! you look very pretty!! 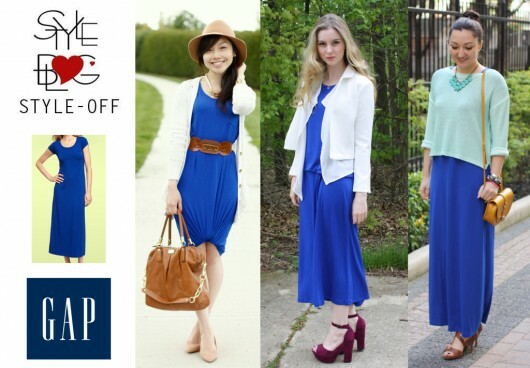 this blue color look fabulous on you ! Adorable as always…super cute way you tied the dress…and great color for you too! What a beautiful and innovative way of styling the dress! Love the accessories that you paired with this outfit.